On a daily basis, I am blessed to provide informal counsel to host of friends and loved ones about thier relationships. Most times, they just want to vent, but others they are looking for an objective opinion and advice. I am really honored that so many people trust me with things so personal and because of that I won't divulge the details of what has been shared with me. What I will do, however, is say that the majority of the people I speak to are dealing with one fatal flaw...and that flaw is found in the distinction of two words: FAULT and RESPONSBILITY. I have a feeling that many of us make the mistake of mixing these two things up, especially in relationships. Think about it. 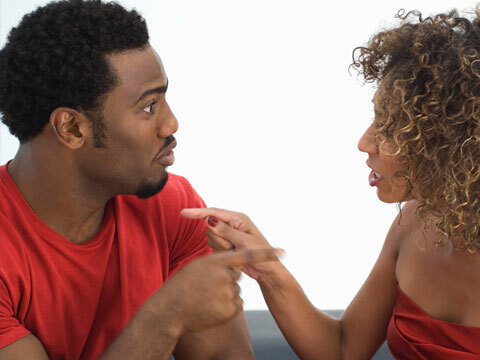 Remember the last time you were having a disagreement with your loved one? How much time did you spend trying to convince the other person that something they did or said was the reason for the fight? How many times have you taken the stance that as soon as they apologize or admit wrongdoing, the fight will be over. It's as if we think that fault finding will somehow lead to a solution. It won't. Nine times out of ten this type of reasoning and unfair fighting only exacerbates the problem. Dr. Phil has a saying that I try to remember every time me and the half wife have a tiff. He says, "do you want to be right or do you want to be married?" I love this quote because it sums up the gist of what a healthy relationship should be about. How important is being right if the argument itself hurts and frustrates the person you love to the point of tears? I know that I am a very lucky person because the times the half wife and I disagree are few, but no matter the frequency it does happen. And when it does I do my best to remember why I love her and why it works between us. Badgering me won't get her what she wants and nagging her won't get me what I want. Plus, honestly, it doesn't really matter whose fault it is...it's both of our responsibility to fix it and since the only person I can control is me, there are times when it may seem like it's "her" fault but it's still my responsibility. I control how much energy I give the fight. I control how much I participate in the fruitless finger pointing and fault-finding. If I choose not to participate by removing myself or trying to neutralize the situation, I have done my part. In the end, all either of us can do is the best we can. And that means making choices that are affirming and not destructive. So we can choose not to speak to each other in anger, we can try not to take things so personal, we can make a joke in a tense situation (if it's appropriate), and we can constantly remind and reassure the other person that our love and commitment is unconditional. In short, we can take responsibility for our role in the relationship...regardless of whose fault it is. Because, is it really that important to win a fight if you lose your relationship? My answer is no.